If you've followed the previous tutorials Part 1 and Part 2 you should now be ready to create a simple java web application called ModelingAgency in Eclipse, in order to learn how MySQL, MyBatis and Tomcat work together. Remember all those jar files you downloaded in Part 1 (the mybatis jar, standard.jar,jstl.jar,etc). Now it's time to make them available to the webapp by placing them under the /WEB-INF/lib folder. You can download all the jar files you need to place in this folder here. In order to connect to the database we have setup in Part 2, we have to add a context.xml file under the /META-INF folder. There are other was to setup a database connection from Tomcat, but placing it in /META-INF/context.xml allows each webapp to be bundled with its database configuration, and is easier to manage in my experience. 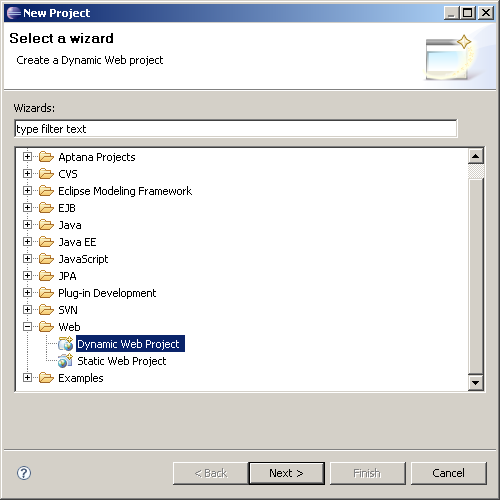 Note:The docBase attribute and path map to the same name as your Eclipse project name. Also, If you have a different username or password that you created in Part 2, other than 'test' make sure to use it instead. The deployment descriptor, web.xml, is the most important piece in any Java webapp (but I'm sure you know that already). In order to make the database connection we defined in context.xml known to your webapp, you should also add a resource entry in web.xml. First, create the following index.jsp file under the /WebContent folder. Make sure the Server's host name is localhost and the Server runtime environment is associated with your Tomcat 6.0 installation. Click Finish.